By clicking on the settings icon at the top right of the Z1 Server screen you can access the settings dialog. The options within the Network tab are explained here. This is the IP address that the Codemasters sim is broadcasting on. If this doesn't match the IP address from Codemasters then the Z1 Server will not be able to connect to that sim. This is the port number that the Codemasters sim is broadcasting on. If this doesn't match the port from Codemasters then the Z1 Server will not be able to connect to that sim. This is the driver name you want to have displayed when you are running a Codemasters sim. The Codemasters sims do not include the name of the driver in the API data feed. So if you leave this field blank then the driver name displayed with a Codemasters sim will either be 'Driver' or the name of the F1 driver whose car you are driving. 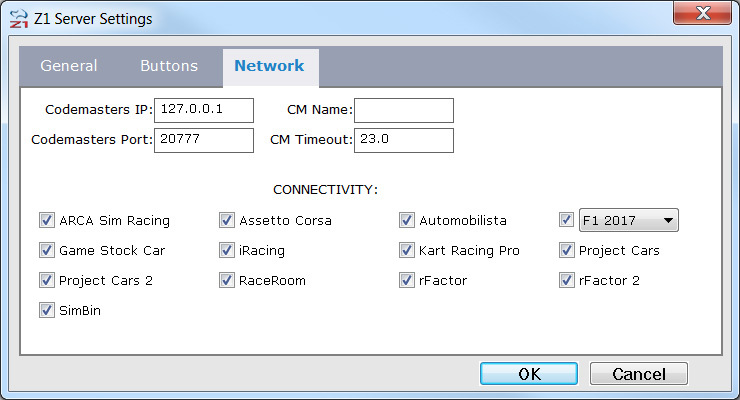 Codemasters turns off telemetry when you pause or exit the sim. Since there is no way for the Z1 Server to know if the sim is just paused or has exited, it will wait for the number of seconds specified here for the sim to resume. If it does not resume within that time frame then the Z1 Server will assume the sim has exited. For the Z1 Server to attempt a connection with a sim its name must be checked in this section. If you only use one of two sims then unchecking the other sims will speed up the process of connecting to the sim when you run the Z1 Server. For Codemasters you need to check the checkbox and then select the version of the sim you want to connect to from the drop down. For F1 2017 there are two options: 'F1 2017' and 'F1 2017 BC'. The BC option indicates that you want to use Codemasters broadcast mode when connecting to the sim.